BCM International is seeking a Camp Manager/Director to help lead a family-style Summer Camp program and year-round Retreats with 70 beds in Central NY State. 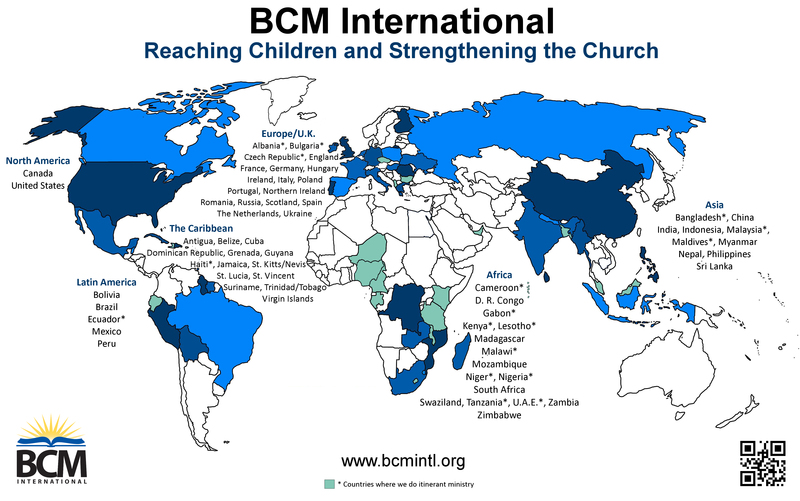 BCM is a non-denominational ministry with a vision of Reaching Children and Strengthening the Church around the world. Cortland Bible Camp has a creative fifty-year history, a strong Bible Club outreach to the community, and an intimate farm location alongside a small river. Standard multi-gifted duties include program, facilities management, budgeting, and ability to work independently. Significant opportunity to mentor summer staff and volunteers to grow in their relationship with Christ. Optional opportunity to expand the local Bible Club outreach. This is a missionary support-raising position and requires agreement with BCM’s doctrinal statement available here. Contact us at reachndevelop@bcmintl.org or call 888-226-4685 for more info. BCM International is opening a new ministry position of Area Director-Western Hemisphere. This individual will have overall administrative responsibility for coordination of ministries, directors, and missionaries assigned to the BCM ministry areas in North America, Central America, South America and the Caribbean. The Director is to engage in planning vison and implementing ministry strategy and accountability for the advancement of the goals and objectives of BCM International. The Director is to provide spiritual leadership and pastoral care for missionaries and other personnel engaged in BCM-related ministries in the Western Hemisphere. This is a missionary support-based position. Contact us at reachndevelop@bcmintl.org or call 888-226-4685 for more info. BCM International (Canada) is looking for a qualified individual to fill the role of Camp Managing Director for their camp, Mill Stream Bible Camp & Retreat Centre located near Omemee, Ontario. View a full job description here. BCM International (Canada) is looking for a qualified individual to fill the role of Food Service Manager for our camp, Mill Stream Bible Camp & Retreat Centre located near Omemee, Ontario. View a full job description here.